Often it is necessary to think a great deal before you do something and after, but﻿ during it is often better to merge with what you are doing: your surroundings, the computer, the horse, the materials that you are making art with. Giving away the control can seem a little scary, but the times when something goes really well for me I am usually not doing very much! 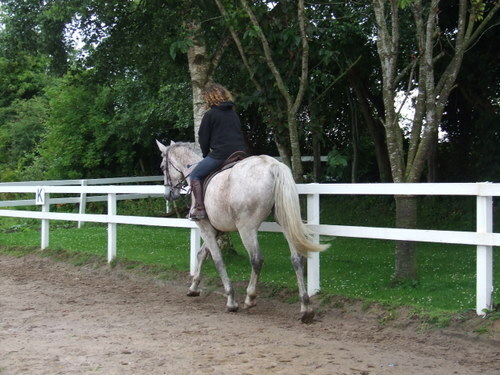 As my riding instructor used to say “like nothing” when I and the horse would jump or do some flat work well. This makes me think about when I am doing art, that I probably think too much a lot of the time. Thinking can limit the possibilities and sometimes stifle creativity. If we allow the parts of us that are usually without a voice to express themselves then we may come across something of a delicate and/or profound nature. In August, I was in a three person show called “Merging 3”. I was the person who wanted to call it Merging. At the time I was not really sure why, but the other night while reading the book called Spiritual Alchemy the author, Dr.Christine Page wrote about how when people merge with what they are doing there are greater results. In an experiment people guessed heads or tails on a computer game, most people go﻿t around 60% correct but the difference between the people who got around 80% was that they talked about merging with the computer. Painting and drawing are exercises in merging for me, merging the different parts of me and the materials that I use and often the environment. I also attempt to merge with something greater then myself and if I am thinking too much then that will hinder any voyages into the unknown. These are three of my resent pieces, they are paintings that have grow out of drawings or even doodles; just seeing what will come out when I let go of control. I am really enjoying using the pigments that James gave me, it is such a different experience to squeezing paint out of a tube. I just got the urge to start painting on this canvas that I thought I had finished! I really liked it but felt that it was not ready to leave the easel, the canvas was asking for some more paint. Then I got this urge to paint a big yellow candle on it, wondering whether it would destroy it or make it I decided to be bold and do it! I am not sure if it makes it more or less but I am very happy I did it! My thought for the day with art, is to throw caution to the wind, if you get a silly sounding or vague ideas follow them. Don’t be expecting them to come in a pretty box all labelled with an instruction manual ! You have to light the candle and hunt them down or at least follow them where ever they may take you. Good Luck! We are getting married on 14 of August! Life and art have always merged for me. So it makes sense for us to get married the same day as having the opening of the exhibition ‘Merging 3’. I have been painting a lot of Love paintings and brides lately! ‘Merging 3’, will be an exhibition of Paintings by myself, Sculptures by Madeleine Irene Smyth and Paintings and Works in Ink on Japanese ply by Mary Foudy O’Halloran. In the Courthouse Gallery in Ennistymon, opening at 7pm on 14th August running till 12th September 2009. It is also James Birthday on the 14 August! No we are not busy at all!! James Is doing wonderful work designing all of the invitations for both the exhibition and our wedding as well as posters, and some other stuff too!